Definition at line 49 of file X86DisassemblerDecoderCommon.h. Definition at line 341 of file X86DisassemblerDecoderCommon.h. Referenced by fixupReg(), readOperands(), and translateOperand(). Definition at line 350 of file X86DisassemblerDecoderCommon.h. Definition at line 36 of file X86DisassemblerDecoderCommon.h. Definition at line 25 of file X86DisassemblerDecoderCommon.h. Definition at line 360 of file X86DisassemblerDecoderCommon.h. Definition at line 445 of file X86DisassemblerDecoderCommon.h. 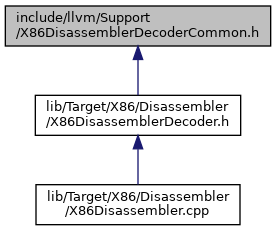 Definition at line 78 of file X86DisassemblerDecoderCommon.h. Definition at line 35 of file X86DisassemblerDecoderCommon.h. Definition at line 24 of file X86DisassemblerDecoderCommon.h. Definition at line 327 of file X86DisassemblerDecoderCommon.h. Definition at line 37 of file X86DisassemblerDecoderCommon.h. Definition at line 26 of file X86DisassemblerDecoderCommon.h. Referenced by decode(), and modRMRequired(). Definition at line 39 of file X86DisassemblerDecoderCommon.h. Definition at line 28 of file X86DisassemblerDecoderCommon.h. Definition at line 40 of file X86DisassemblerDecoderCommon.h. Definition at line 29 of file X86DisassemblerDecoderCommon.h. Definition at line 44 of file X86DisassemblerDecoderCommon.h. Definition at line 33 of file X86DisassemblerDecoderCommon.h. 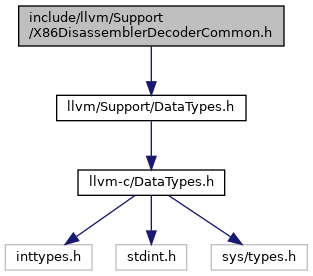 Definition at line 38 of file X86DisassemblerDecoderCommon.h. Definition at line 27 of file X86DisassemblerDecoderCommon.h. Definition at line 410 of file X86DisassemblerDecoderCommon.h. Definition at line 41 of file X86DisassemblerDecoderCommon.h. Definition at line 30 of file X86DisassemblerDecoderCommon.h. Definition at line 42 of file X86DisassemblerDecoderCommon.h. Definition at line 31 of file X86DisassemblerDecoderCommon.h. Definition at line 43 of file X86DisassemblerDecoderCommon.h. Definition at line 32 of file X86DisassemblerDecoderCommon.h.